WINDSOR, ENGLAND (EVENING STANDARD)--Meghan Markle today unveiled her vision for her new role as the Duchess of Sussex as she was officially welcomed into the Royal family following her extraordinary wedding to Prince Harry. 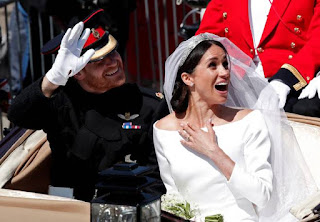 The American former actress was given her own web page on the Royals official website just hours after she married Harry in a landmark ceremony at St George’s Chapel, Windsor, on Saturday. It details how Meghan devotes her time to supporting charities and organisations including the global forum One Young World and UN Women. She famously received a standing ovation for a speech on the importance of gender equality on International Women’s Day for UN Women in New York City in 2015. It also details how Harry’s new wife, 36, has volunteered in soup kitchens throughout her life and how she arranged for leftover meals from the Suits set to be donated to local homeless shelters in Toronto. However, Meghan’s acting career, including her role as Rachel Zane in the hit legal drama, is not mentioned until the second ‘Biography’ page which is listed on the site. “From a young age, The Duchess had a keen awareness of social issues and actively participated in charitable work,” the official page for the Duchess of Susssex read. “Aged 11 she successfully campaigned for a company to alter their television advert that had used sexist language to sell washing-up liquid. Her Royal Highness also volunteered at a soup kitchen in Skid Row, Los Angeles from the age of 13-17. “She continued to volunteer at the soup kitchen when she would return home to Los Angeles until the age of 22. “These early experiences helped to shape her lifelong commitment to causes such as social justice and women's empowerment. The page also cites Meghan’s work as a global ambassador for the charity World Vision. In her work with the charity, she visited Rwanda and met with children there as part of a clean drinking water project in the East African country. She also visited India with World Vision to bring a greater awareness to girls’ lack of access to education there. In Mumbai, she witnessed the work of the Myna Mahila Foundation who empower women through access to menstrual hygiene products and employment opportunities. Meghan became the first mixed-race member of the royal family on Saturday in a sign of the changing face of the monarch in the 21st century. After a day that saw the couple seal their union with a tender kiss, process through Windsor in a horse-drawn carriage and experience a moving wedding reception speech in their honour from the Prince of Wales, they travelled home on Sunday to prepare for royal duties. Meghan and Harry will not immediately leave for their honeymoon but remain in the UK for a period before taking the traditional break. Harry’s new wife has already spoken of her desire to "hit the ground running" as she becomes a full-time royal. On Tuesday, the couple will join Charles and Camilla on the lawns of Buckingham Palace for a Prince of Wales 70th Birthday Patronage Celebration. Countries like Botswana - which offer stunning wildlife, breathtaking scenery and, importantly, privacy from prying eyes - could be top of the list for their honeymoon locations. Botswana is a place Harry loves and knows well, and he reportedly whisked his fiancee to the southern African country in 2017 to mark her 36th birthday. Harry and Meghan exchanged vows in front of 600 guests including the Queen, more than 30 royals and famous faces including US chat show queen Oprah Winfrey, tennis champion Serena Williams, actor George Clooney and his barrister wife Amal Clooney, Sir Elton John, David and Victoria Beckham and actor Idris Elba. As adoring fans cheered them on, the new Duke and Duchess of Sussex shared a kiss moments after pledging to spend the rest of their lives together in a stunning service at St George's Chapel. Harry had wiped away a tear during the ceremony, which combined the traditional with the quiet revolutionary as the modernisation of the royal family reached a new stage. The groom had appeared visibly nervous as he sat alongside his best man and older brother William in the run-up to the arrival of the bride for her induction into the royal family. On her entrance to the chapel, Meghan stunned a global audience of millions in an elegant Givenchy dress designed by Brit Clare Waight Keller. The dress featured a five metre-long veil embroidered with flowers from each of the 53 Commonwealth nations. Meghan also wore the glittering Queen Mary's Diamond Bandeau tiara, loaned to her by the Queen. She walked herself up the steps to the chapel - with help from her two pageboys - before being greeted by Prince Charles who walked her down the aisle. Her father, Thomas Markle, who was due to walk her to the altar, was absent after undergoing a heart operation in Mexico this week, and her mother Doria Ragland looked on from the chapel’s pews. As they met at the altar, Harry told his wife-to-be “You look amazing, just gorgeous”, and the couple beamed at one another. The Archbishop of Canterbury, Justin Welby, then proclaimed Harry and Meghan husband and wife after they said their vows and exchanged rings. Their personalised vows did not include a promise from Meghan to “obey” her husband, as has been traditional in previous royal weddings. The couple then shared a kiss on the steps of the chapel before being whisked away in a horse-drawn carriage for a procession in front of adoring fans. Meghan immediately looked at home in her new role, waving to the tens of thousands of royal enthusiasts who lined Long Walk outside Windsor Castle after the ceremony. The thirty members of the royal family present included Harry’s grandmother the Queen, in a lime green outfit, and the Duke of Edinburgh, who walked unaided at the age of 96. Aside from the bride and groom, another undisputed star of the show was African-American bishop the Most Reverend Michael Curry, who brought a dose of energy to the proceedings with an emphatic sermon entitled The Power of Love. As Meghan, 36, looked on laughing and clearly enjoying the speech, other members of the audience including Camilla, the Duchess of Cornwall, appeared slightly more bewildered. Sir Elton, who sang at the funeral service for Harry's mother, Diana, Princess of Wales, performed at the lunchtime reception. The royal family expressed gratitude to all those who enjoyed the wedding, saying on the official Twitter account: "Thank you to everyone who came to Windsor and those who followed from around the UK, the Commonwealth, and the world today. Congratulations once again to the newly-married Duke and Duchess of Sussex. #royalwedding." The celebrations culminated in a black-tie wedding dinner staged at Frogmore House and hosted by Charles for 200 of the couple's closest friends and family. Meghan changed into a lily white halter neck dress by Stella McCartney.